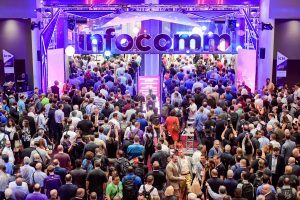 InfoComm 2018 took over the Las Vegas Convention Center earlier this month, drawing nearly 43,000 to the annual A/V show. And, although much of the technology on display was familiar to attendees who had also attended NAB 2018, many exhibitors took advantage of the new audience to showcase their gear in a new light. The annual A/V show attracted nearly 43,000 attendees to the Las Vegas Convention Center. For the sports-venue personnel, consultants, and systems integrators in attendance, InfoComm 2018 boasted much to see: laser and lamp projectors for concourse displays, PTZ cameras to capture content from around the venue, KVM systems to maximize control-room flexibility, IPTV to ensure that fans never miss a minute of the action, and much more. 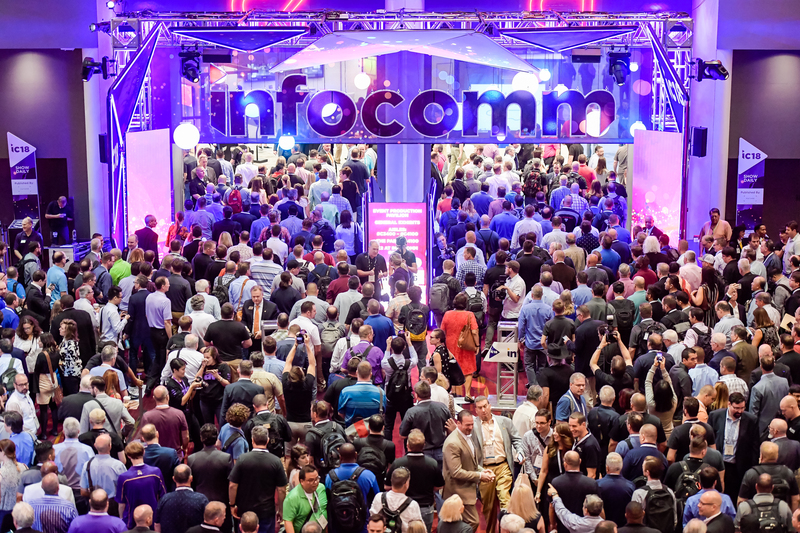 Read on for a recap of what you may have missed on the show floor; for all the news from InfoComm 2018, CLICK HERE. For an in-depth review of audio at InfoComm 2018, CLICK HERE. This year’s InfoComm marked the first for Legrand’s newly formed AV division, which showcased the latest gear from its Middle Atlantic, Chief, Da-Lite, and Vaddio brands. Middle Atlantic showed off the pivoting capabilities of its wall-mounted control-room racks, which are available in a variety of heights and widths and are suited to rooms where access to the back of the rack is needed but space is at a premium. Chief highlighted its LED-video-wall–mounting systems; Da-Lite touted its Design Center, which works with clients to deliver custom installations; and Vaddio promoted the features of its new PTZ camera in a side-by-side comparison with a competitor’s offering. The Blackmagic Design booth featured plenty of A/V gear, including a range of cameras (such as the new Pocket Cinema Camera 4K, introduced at NAB 2018), HD and 4K-capable switchers, and recorders. The company aims to cater to all levels of the industry and featured a number of products at price points attractive to colleges, smaller venues, and others. Canon’s booth shined a spotlight on its growing portfolio of laser and lamp projectors with short-throw and long-throw lenses for a variety of applications. Featured projectors included the new REALiS WUX7000Z laser and REALiS Wux7500 lamp LCOS models. Visitors to the booth were able to take part in hands-on demos of Canon’s professional 4K and HD imaging products, including the popular 4K reference displays, pro camcorders, and cinema cameras and lenses. Riedel’s all-new Bolero Standalone Application, a license-enabled upgrade for the Bolero wireless intercom system, delivers several performance enhancements along with standalone capabilities. The company also demonstrated its new 1200 series SmartPanel, which features multiple full-color multitouch displays, 32 innovative hybrid-lever keys, the ability to leverage apps for multifunctionality, and the ability to adapt easily to the various workflows in use today. Targeting the sports-venue market, Ross Video highlighted its integrated sports-venue solutions: a Carbonite switcher, XPression real-time motion graphics, and Abekas Mira replay server were tied together by the DashBoard control system. In addition, the booth featured many of the products launched at NAB 2018, including the Carbonite Mosaic multiscreen image processor. Sony highlighted its full line of display, A/V, and presentation technologies, including the immersive 8Kx4K Crystal LED display system, pan-tilt-zoom (PTZ) cameras, and BRAVIA professional displays for digital signage, content creation, simulation, corporate, faith, and higher education. Building on its NAB Show momentum, Adder again exhibited its ADDERLink INFINITY 100T (ALIF100T) Zero U, USB-powered KVM transmitter. Complementing the existing ADDERLink Infinity range with a Zero U option, the ALIF100T simplifies the upgrading process of KVM systems from analog to digital, while freeing up crucial rack space — necessary in control rooms where space is at a premium. At the AJA Video Systems booth, the focus was on its new Hi5-12G, a 12G-SDI–to–HDMI 2.0 Mini-Converter, and HA5-12G, an HDMI 2.0–to–12G-SDI Mini-Converter; each is available in three configurations, with or without fiber SFPs. The new Mini-Converters streamline transmission of high-resolution, high-frame-rate, and deep-color content over long distances. IHSE introduced an all-new solution to extend and switch immersive-reality signals over long distances using Draco KVM systems. It addresses growing interest in virtual- and augmented-reality (VR/AR) systems in a wide variety of pro-A/V market sectors: in corporate and education applications, such as product design and prototyping; in situational training and advanced control environments; and in retail and leisure applications, including cinemas, shops, and museums. NewTek teamed with Panasonic to demonstrate NDI signage designed to direct any video and audio source to any monitor on a standard Gigabit network. Combining the power of NewTek’s NDI Studio Monitor software with industry-standard signage allows addition of another stream as a separate overlay. Monitors and sources can be managed with a web application from any networked laptop, tablet, or phone. This demonstration showed the capability to direct any A/V source and any overlay to any monitor with ease and efficiency over IP while spotlighting creative possibilities and cost-saving opportunities for A/V customers. The Panasonic booth touted development of a new 4K integrated remote camera that will offer 4K UHD/60p capture. The AW-UE150, which incorporates a 1-in. large MOS sensor and 20X optical zoom, will ship by the end of this year. Also showcased were Panasonic’s line of 4K displays for A/V installations and a demo of its PT-RZ120 12,000-lumen projector. VITEC featured the new video-wall capability of EZ TV, the company’s broadcast-grade IPTV and digital-signage platform, as well as its expanded HEVC ecosystem. The video-wall solution is designed to simplify deployment and management of projects involving IPTV, digital-signage, and video-wall content. In addition, the company used InfoComm 2018 to highlight recent customer successes, including a recent IPTV installation at the Minnesota Vikings new training facility. The FOR-A booth lineup included HVS-490 and HVS-100 HANABI switchers, ClassX content-creation and graphics-playout solution, and the Variant Systems Group’s Envivo Replay sports- and live-event–replay solution. The HVS-490 is 3G standard with option to upgrade to 4K; the HVS-100/110 are 3G and 4K standard. For control-room personnel looking to increase the flexibility of their spaces, often the first step is a KVM system. At InfoComm 2018, G&D showed off its latest KVM highlights and offered advice on how best to deploy KVM in control-room applications. The star attraction of the booth was G&D’s new ControlCenter-IP, a centralized KVM matrix that enables switching of all connected computer and workstation modules. JVC Professional Video announced an upgrade for its RM-LP100 remote camera controller that enables tally compatibility with the new Roland V-60HD switcher. The V-60HD switcher converts tally signals from its RS-232 port and sends them via LAN to the RM-LP100 controller, which distributes them to the KY-PZ100 PTZ production camera and other IP-enabled ProHD, 4KCAM, and CONNECTED CAM models. After a successful showing at NAB 2018, Marshall Electronics introduced its lineup of POV cameras to the A/V market, including the CV502-U3 HD USB unit. Ideal for the professional A/V and UCC markets, the CV502-U3 offers users connectivity, performance, and reliability required by sports venues and broadcasters. For VidOvation, InfoComm was the ideal audience to show off its Enterprise IPTV video-networking system, a turnkey in-house system for flexible, scalable distribution of high-quality video, live television, and digital signage over an enterprise, corporate, or facility network. According to VidOvation, the system can also stream digital programming to computer desktops, smartphones, tablets, displays, Smart TVs, and set-top boxes.